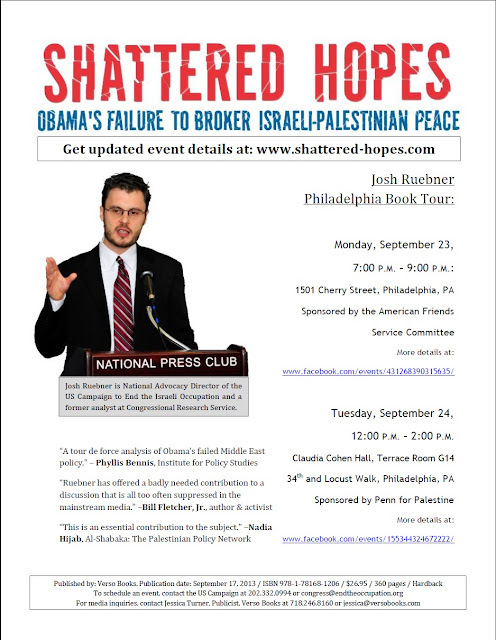 Last week, Josh announced the publication of his first book, Shattered Hopes: Obama's Failure to Broker Israeli-Palestinian Peace. For those of you in the vicinity of Philadelphia, his book tour will take him to your area next week, from Monday, September 23, to Tuesday, September 24. Below is a flyer (click here for a larger version) with all the event details. And click here for a larger PDF version.